With the construction of the base of the temple completed, I proceeded to paint the completed assembly using smokey beige satin-finish Rust-Oleum Ultra Cover spray paint. I also decided to go forward with construction of the mounting base. This was actually from Step 27 in the instructions, but I had the parts out and didn’t see any reason not to go ahead with this assembly. The base of the pagoda painted a stoney gray color. If I wanted to get more authentic, I would have painted it earlier in construction and masked off areas to create different shading for the different stone blocks. 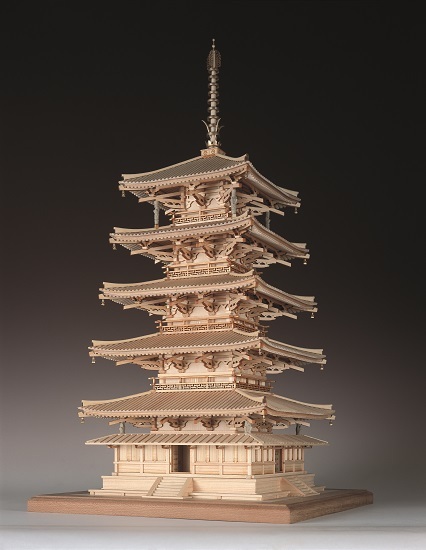 This entry was posted in All News, Horyu-ji 5-Story Pagoda, My General Blog, Non-Ship Models, Woody Joe and tagged 5-story pagoda, Horyu-ji, Japanese temple on October 14, 2018 by catopower. 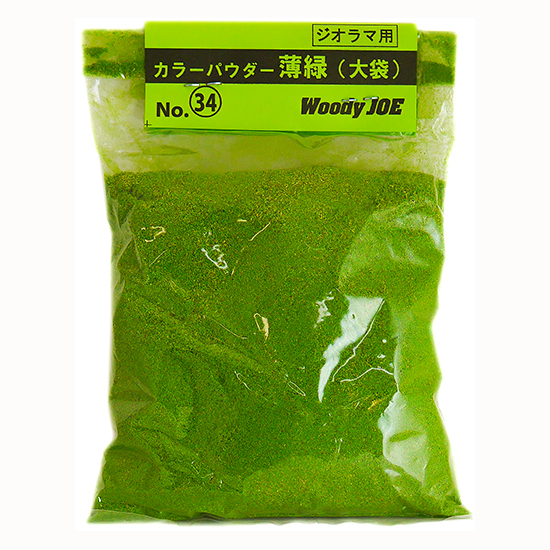 Just saw that the online Japanese hobby store, Zootoyz.com, has just added Woody Joe diorama products. 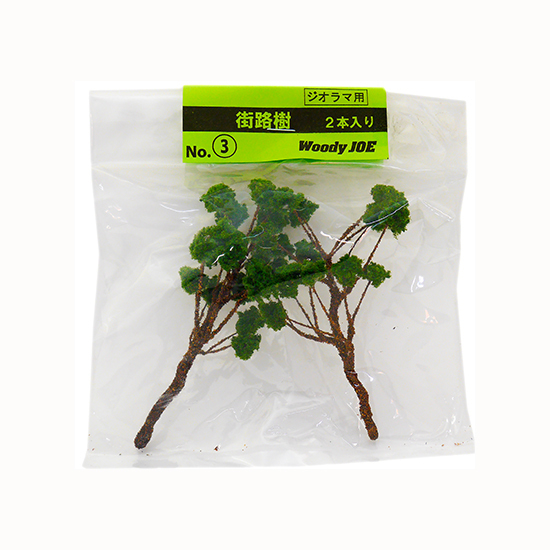 This line of products includes sakura, cherry blossom trees, Japanese pines, cypress trees, box trees, cedar trees, generic broadleaf and conifer trees and other vegetation. There are also bags of ground cover for simulating grass, dirt, and gravel. This entry was posted in All News, Non-Ship Models, Vendors, Woody Joe and tagged Diorama, Zootoyz on October 9, 2018 by catopower. Last year around this time, I purchased a few Woody Joe temple and mini architectural kits from none other than Zootoyz, where I buy all my Woody Joe kits. Incidentally, if you haven’t visited in a while, you should check it out. Morikawa-san revamped the site and it looks really nice. If you buy a kit from him and build it, be sure to send him photos. Also, the folks at Woody Joe would love to see them too. In any case, in early January, I had a weekend to kill, so I started one of the mini-kits. This one is called Sato no chaya, or Sato’s tea house. It’s a very simple kit that costs around $26 plus shipping. My guess is that the scale is somewhere around 1/50. This entry was posted in All News, Non-Ship Models, Sato's Teahouse, Ship Modeling News, Woody Joe and tagged Zootoyz on January 28, 2018 by catopower. The first stage of construction is the stone base of the structure. Being a wooden kit, this is of course made from wood. The parts are perfectly milled, so there’s no cutting or sanding involved, just aligning and gluing. I didn’t glue the Square insert into place yet, as it’s not added until Step 2, but I dropped it into place to help with the alignment. As it turns out, it’s not helpful, as it fits a bit loosely, and my cutting pad has a printed grid that allows me to check the corner angles. By the way, I really like the ModelCraft cutting mats. The one I’m using here is an A4 size. That’s roughly 12″ x 8″, which I bought from the ModelCraft Tools USA, which is run by Ages of Sail. In fact you can just buy it from their website too. I really like these cutting mats. This one was only $13.99 plus tax and shipping. This entry was posted in All News, Horyu-ji 5-Story Pagoda, My General Blog, Non-Ship Models, Woody Joe and tagged 5-story pagoda, Horyu-ji, Japanese temple on December 2, 2017 by catopower. So, it begins! I got this kit from Zootoyz.jp earlier in the year, along with some other temple and Edo period architecture kits. One of those kits, the Shinmei-zukuri Shrine, I built and wrote about here. But, I’ve had too many other projects to work on to get to any of these other kits. Well, it’s been long enough. We’re approaching the end of the year, when I traditionally build some kind of simpler Japanese kits. Since I made a promise to get to this kit, specifically, I’m pulling the kit out of the closet and setting it out to build. This will make a nice size model, measuring about 18.5″ tall on a 10-1/4″ square base when done. There are more than 870 parts, mostly milled wood, though there are some wood strips and smaller laser-cut sheets. The kit is listed by Woody Joe as requiring 50 hours to build. I think this may be a revision of an early figure of 40 hours to build, as that’s what I recall and that’s what Zootoyz.jp states. In any case, it will take a lot less time than a ship model. This entry was posted in All News, Horyu-ji 5-Story Pagoda, My General Blog, Non-Ship Models, Woody Joe and tagged 5-story pagoda, Horyu-ji, Japanese temple on November 24, 2017 by catopower. Yesterday, I created my first Youtube video, and I really like the way it turned out. 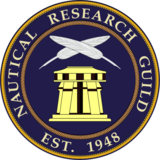 It’s not about ship modeling, but it IS about a project that I posted about on this site. Also, it’s not exactly a movie, it’s more of a slide show, but it’s a start. The subject is the construction of the recently completed Japanese shrine kit that I got from Woody Joe (purchased from Zootoyz.jp) earlier this year. It turns out that it was easy to use Youtube’s video editor. It was almost identical to the way Apple’s iMovie software, which I’m quite familiar with. The slideshow I made isn’t perfect, but it makes the build look really good being presented with cross-fades to a nice musical score. Hopefully, people are okay with the music. I personally get really sick of those modern canned scores that are most common with these Youtube videos. I did use one of the stock music scores, but, being particularly sensitive to them, I spent a LONG time listening to different pieces. It’s a bit limiting, looking for music that will fit a shinto shrine project. But, I think the music works okay. At least it has the sound of some Shakuhachi, Koto and Shamisen. I promise this won’t be my last effort. This has inspired me to look at other projects to see what I have enough decent photos of that would be interesting to see in a similar slideshow format. Most of those look to be the Japanese models I’ve built in the last few years. In the future, maybe I’ll try to do an actual video, but I usually find those boring, so it will be a major effort for me if I do try it. Anyway, I’d be happy to hear from anyone with suggestions. Please check it out. This entry was posted in My General Blog, Shinmei-zukuri shrine, Woody Joe and tagged Japanese Shrine, Youtube video on July 12, 2017 by catopower. 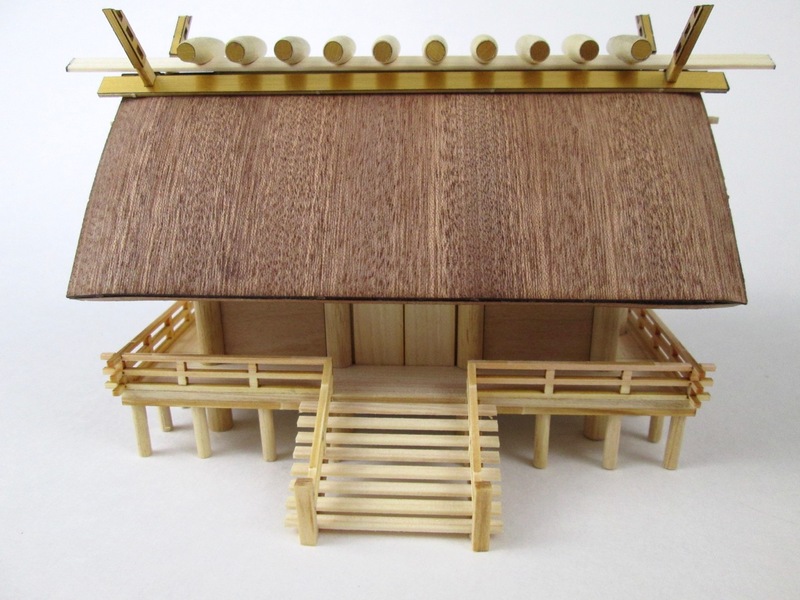 This is the final installment of the building of Woody Joe’s Shinmei-zukuri jinjya or Shinmei-zukuri shrine kit. 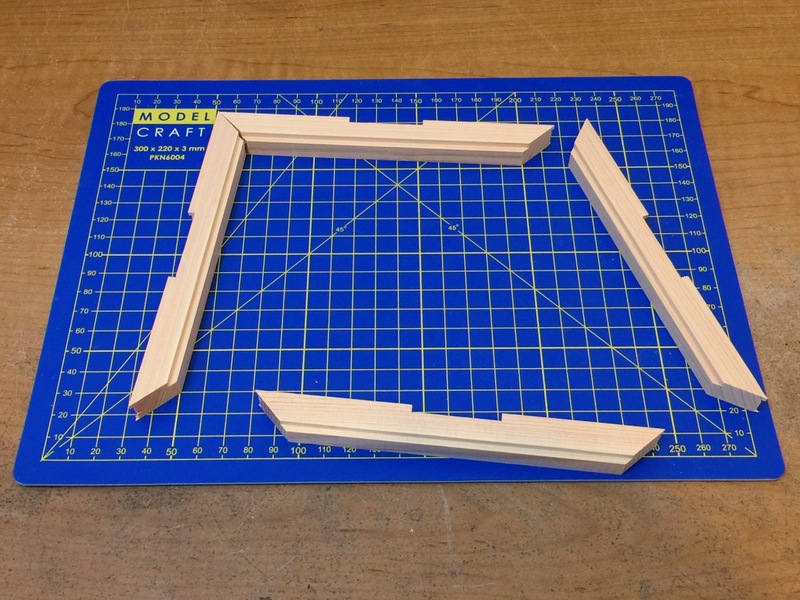 The final four steps are mostly really simple and quick, though Step 10, which is the construction of the fence, involves more wood cutting than any other step of the kit. Still, I figured I should wrap up the build with one posting. 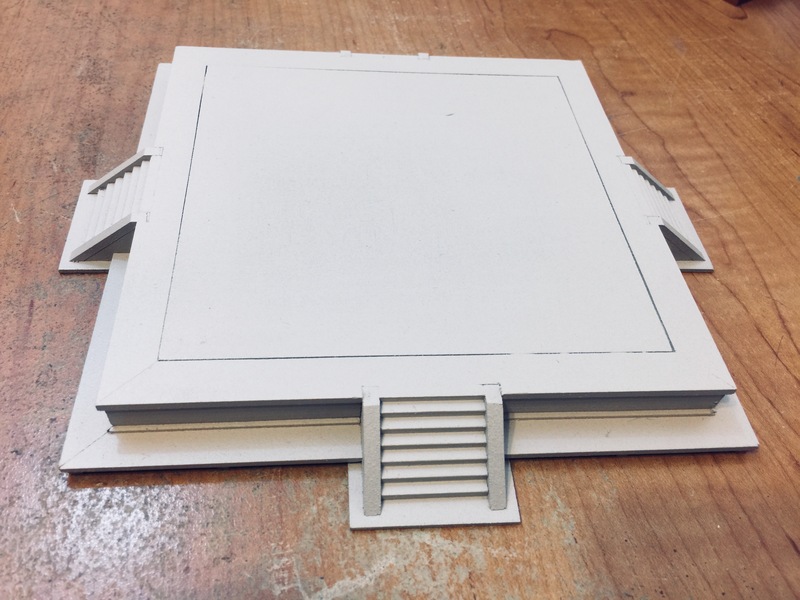 The appearance of the model, going into the final steps of construction.. This entry was posted in Non-Ship Models, Shinmei-zukuri shrine, Woody Joe and tagged Japanese Shrine on May 23, 2017 by catopower. Coming into the last 1/3rd of the build, things are speeding up a bit as steps seem to be getting simpler. As a result, this time, I’m covering both step 7 and step 8. I haven’t been able to figure out what the word katsuogi means in this context. It translates to bonito, a kind of fish. In this case, it refers to these tapered logs that decorate the top of the shrine. Now, perhaps they represent fish in some way, but according to this Wikipedia entry, they are indeed called katsuogi and are purely decorative. This entry was posted in Non-Ship Models, Shinmei-zukuri shrine, Woody Joe and tagged Japanese Shrine on May 11, 2017 by catopower. The previous step was to assemble the framing for what might be termed the outer roof. 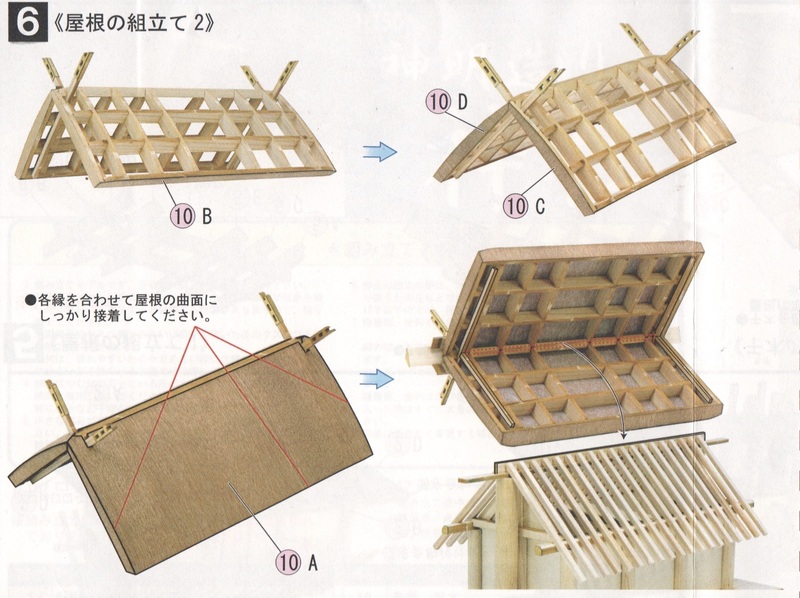 Not knowing the details of the actual shrine architecture, I suspect that the real shrine might just be some very thick thatched covering that does not include this framework. I don’t know this for sure, and if anyone has access to information on this detail, I’d love to hear from you. This entry was posted in Non-Ship Models, Shinmei-zukuri shrine, Woody Joe and tagged Japanese Shrine on May 9, 2017 by catopower. Continuing on, Step 5 is the last step on the first side of the instruction sheet and deals more with the roof construction. This time, I was able to divide up this step into left and right halves, so the above is the left side of the instruction sheet for step 5. 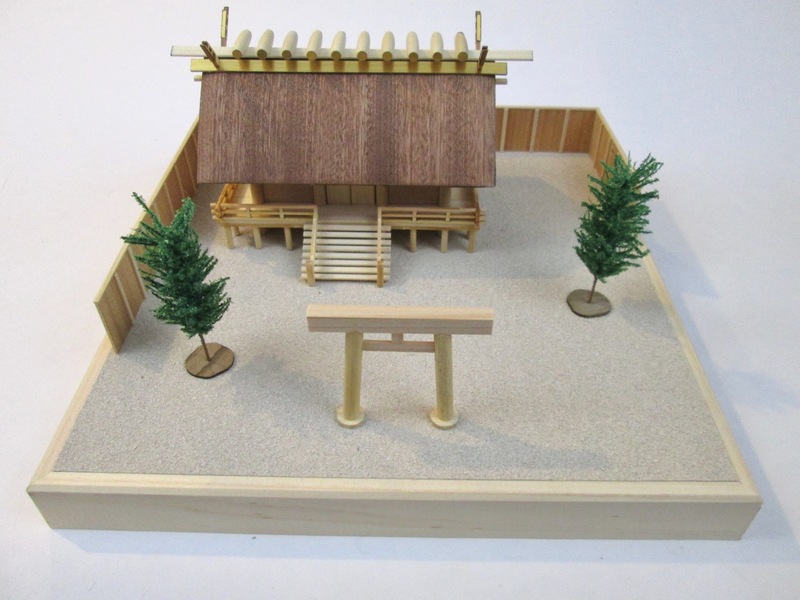 This entry was posted in Non-Ship Models, Shinmei-zukuri shrine, Woody Joe and tagged Japanese Shrine on May 4, 2017 by catopower.